(CNN) -- Alastair Cook cracked his highest Test score -- an unbeaten 139 -- as England ended the fourth Test with a draw against West Indies at Bridgetown, Barbados. England's Cook celebrates his eighth Test century before the match against West Indies ends in a draw. Cook's eighth Test century was also his highest Test score while Kevin Pietersen weighed in with 72 not out as the tourists remained one down in the series with one match to come. The pair shook hands with their West Indian opponents at 3.50pm local time after declaring on 279 for two. England declared at 279 for two wickets after any hopes of a win disappeared when the Windies amassed 749 for nine declared on Sunday in reply to the tourists first innings of 600 for six declared. Having been dismissed for just 51 already in this campaign, England highlighted the freak nature of that day at Sabina Park by comfortably wiping out their 149-run deficit on first innings. Cook, who started the fifth day on nought in an overnight score of six without loss, celebrated his first hundred at this level for more than 14 months before tea and became the third-youngest player, behind Sachin Tendulkar and Ramnaresh Sarwan, to pass 3,000 Test runs. Apart from a sharp reaction from Sulieman Benn at leg slip which encouraged umpire Russell Tiffin to ask for television assistance on a run-out appeal, the 24-year-old Cook's only life came in the penultimate over of the first hour. The Essex left-hander had made 30 when he top-edged a slog-sweep off giant spinner Benn which Brendan Nash failed to catch running back from midwicket. Cook passed 50 for the fourth time in as many innings this series before lunch and ploughed to three figures in the middle session when he turned a delivery from Ryan Hinds through midwicket for three. 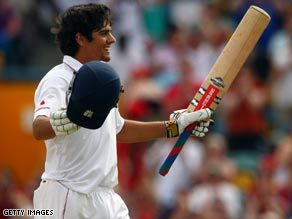 Pietersen, meanwhile, reached a 74-ball 50 shortly afterwards to continue the rich form of the batsmen since their Jamaican capitulation. The loss of captain Andrew Strauss for 38 was the only setback before lunch while Owais Shah also went to spin to give West Indies a brief glimmer of hope.